Where to Play The Incredible Hulk for Real Money? Much like the massively popular movies of the Marvel Cinematic Universe, the slot game based on their meanest hero, the Incredible Hulk, is quite the looker. However, this Hulk slots game isn’t just fancy graphics with no substance - it has all the right features to keep non-comic fans hooked just the same as players who are as enthusiastic about comics as about gambling. Playtech’s Incredible Hulk slot plays by the same rule-set as the other of the developer’s Marvel themed games, but has become the most popular among them. 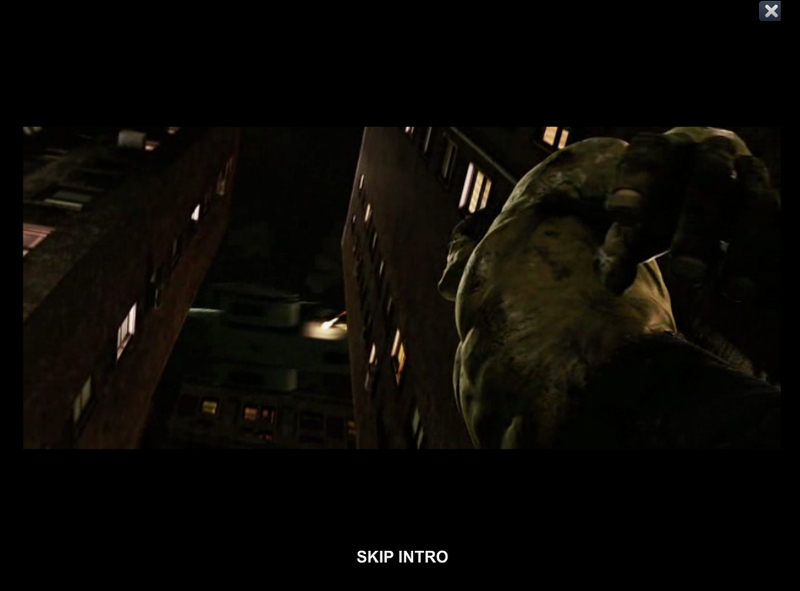 Unlike its counterparts which make use of licensed footage from the Marvel films, Hulk uses original assets and art that more evokes the comic book feel. 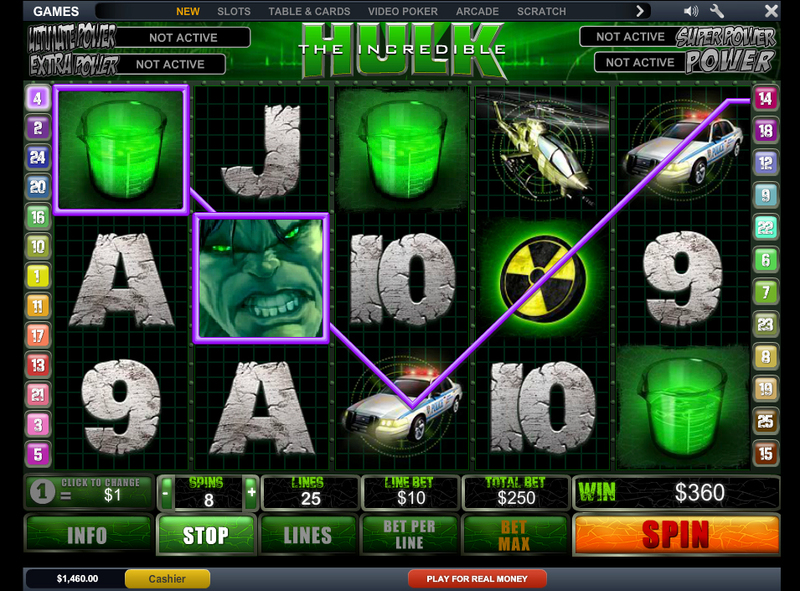 How to Play The Incredible Hulk Casino Game? 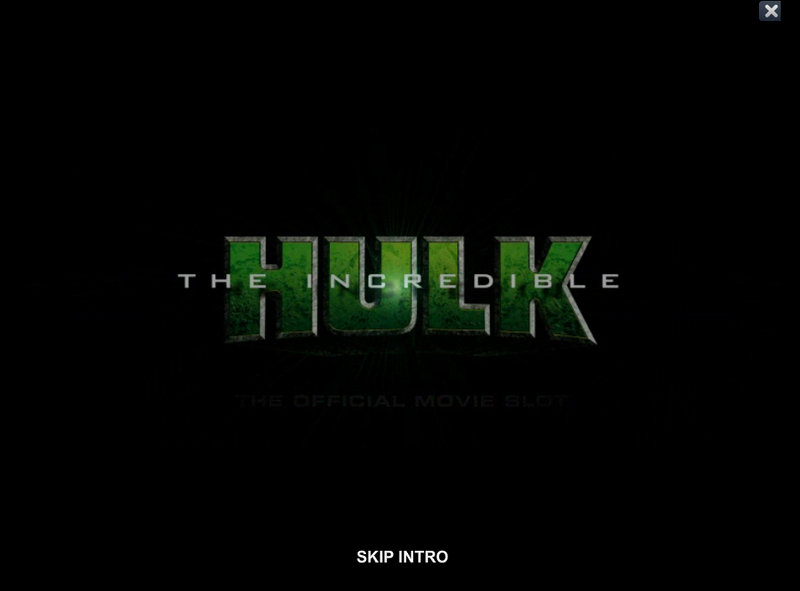 The Incredible Hulk Slot game has five reels and 50 paylines (25 if you’re playing the free version, but then why would you?). 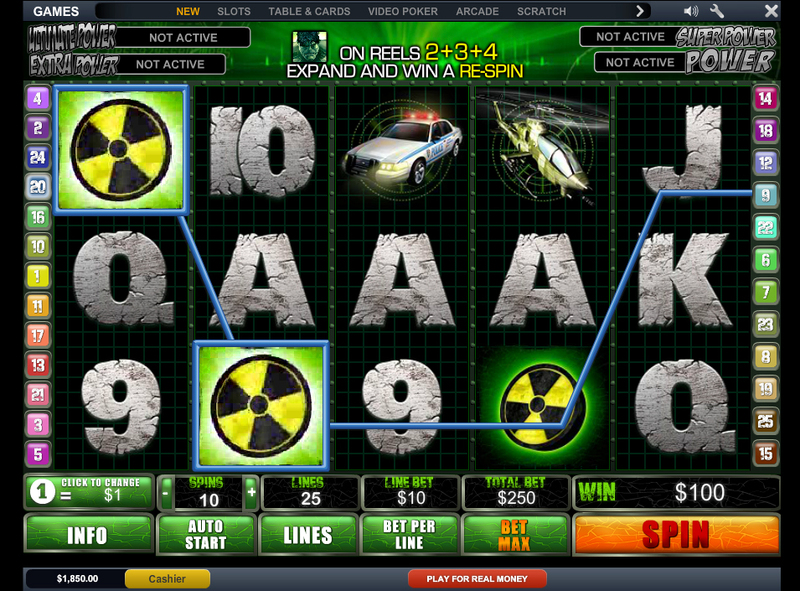 Playtech has mixed a few sweet play features into the slot to make things interesting. This particular online slot has developed a pretty big following, and a mobile version for iOS and Android has also been released. The betting limits on this slot are 2.50 at the minimum and 12,500 at maximum, making it a pretty high-stakes slot as far as online games go. 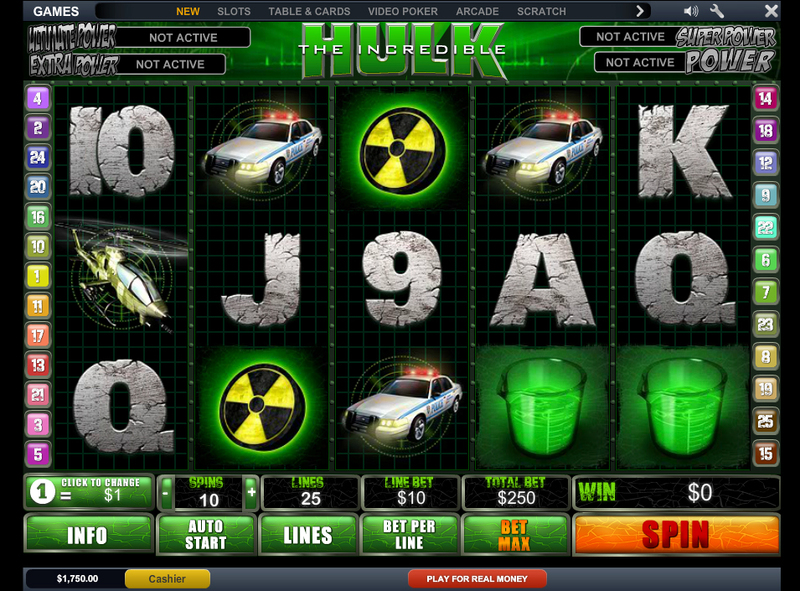 Hulk features a solid, multi-tiered expanding wilds system, free spins activated by scatters and the “Smash Bonus”, all of which are accompanied by some pretty flashy animations. Of course, Marvel’s progressive jackpot metagame cannot be left without a word either. When it comes to this so-called multi-level jackpot, random is the name of the game. Basically, all four Playtech Marvel games are interconnected through this ever-growing progressive jackpot. There are no special rules for entry - you simply play, and whether or not you hit the pot is entirely random. There are four kinds (Power, Extra Power, Super Power, Ultimate Power), and obviously the more flashy the name, the bigger the win. When you hit the pot, a small 4x5 grid of “match the pairs” appears. Depending on the images you manage to match, you’ll win one of the four tiers, guaranteed - the only question is which one. The expanding wilds in this slot appear in two forms. If you get a wild symbol (meaning Hulk himself in all of his green glory) in the center position of reel 3, the reel will be expanded and you’ll be rewarded with 2 re-spins. Surprisingly enough, this happens pretty often. The other form of wilds happens as rarely as the previous one does often - in fact, this almost feels as big as a jackpot, based on rarity alone. Should you line up a wild symbol on reels 2,3 and 4 in the middle row, reels 1 and 5 will be re-spun free of charge. On its own, this isn’t a big deal, however if you get lucky with the symbols on the re-spin, you could hit big. Like with the wilds, there are two versions - one pretty frequent, the other more rare - of scatters. 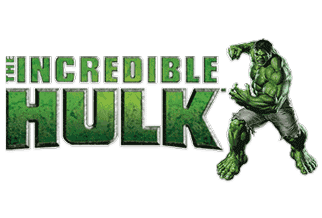 In this slot, the Hulk logo acts as the scatter symbol, and if you get three of them anywhere on your reels (even on un-achieved paylines), you win x10 of your initial bet, and 10 free spins will automatically start with a x3 multiplier. By “pretty frequent”, we meant in relation to the second version - even this bonus is more than a tad elusive. However hitting five scatters on your reels at once is almost impossible. This massive win will give you x100 of your bet. Yes, you read that right - and the 10 free spins apply here as well. Stack this with expanding wilds during your free spins to activate even more free spins, and the slot will be playing itself in your favor. It’s fitting that the character’s most iconic move should get a mini-game of its own. Whenever you get a Smash symbol anywhere on reels 1 and 5 simultaneously, you will be greeted with a scene where the Hulk towers over 5 police cars. The cars randomly hide small amounts of cash, and you get to pick which three to smash, gaining the money they covered. Once this is done, three attack helicopters will zoom in, each containing a multiplier that will affect the police-car-winnings. You will be able to smash one of these, applying the multiplier to your winnings. Hulk Rage is an augmented version of this, which is triggered randomly. Rage basically makes Hulk smash all police cars and helicopters, applying all bonuses and giving you a hell of a payout. With the relatively high bets, pairs of frequent and rare bonuses and the constant barrage of high-quality animations and graphics, this slot is guaranteed to keep you on the edge of your seat throughout your session. The Incredible Hulk slot machine lives up to the source material - this is one beast of a game, which makes small wins frequent enough to keep you hooked, and while winning big is rare, when it happens it’s so big that you’ll turn into the Hulk yourself. However, instead of anger, you’ll do it because you’ll have no other way to express your joy.